The 1200 Lumen LED Flashlight is a powerful tactical flashlight that's weapon mountable. The water resistant textured body provides a comfortable, secure grip and a beveled edge offers added protection. Its high-efficiency LED generates a brilliant, penetrating 1200 Lumen beam that can easily blind an attacker momentarily. This flashlight is activated by a pressure-sensitive push on/off button, with three levels of light output, an SOS pattern and strobing modes. Runtime for 1 set of 2X 18650 batteries is 2 hours at high output and 6 hours at low output. A charger and 2X 18650 rechargeable lithium batteries are included. Tbook.com crawls the web to find the best prices and availability on Flashlights and related Tools and Hardware products like BARSKA Lithium LED 1200 Lumen Rechargeable Flashlight. For this page, related items include products we find that match the following keywords: "Flashlight" at our vendor partner Home Depot. 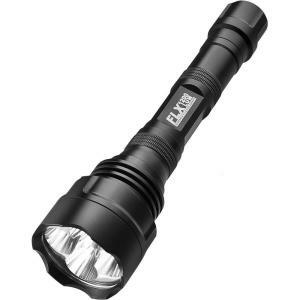 BARSKA Lithium LED 1200 Lumen Rechargeable Flashlight is one of 152 Flashlights and related products listed in the Tools and Hardware section of Tbook.com If you have any questions on this product, please give us a call at 734-971-1210 during the hours of 9am - 5pm EST for assistance. Thank you for shopping at Tbook.com, the Internet Department Store!